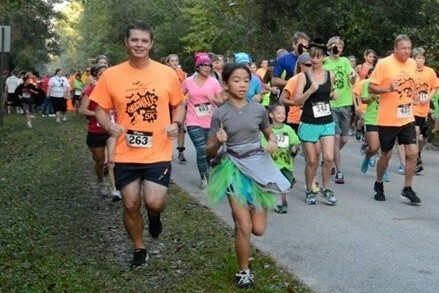 Join us Saturday, October 29th for the annual Mudwalk Spooky 5K Run/Walk at Winter Springs High School. 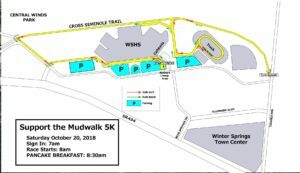 The 5K will start at Winter Springs High School and run along the Cross-Seminole Trail and back to the high school to finish with our traditional pancake breakfast and awards presentation. The 5K will be decked out with our spooky theme for Halloween including friendly zombies and some ghoulish fun. For safety reasons, in-line skates, skateboards and dogs ARE NOT allowed in the race. Headphones are discouraged. Baby-joggers and strollers are allowed but must begin at the back of the starting corral. Online registration opens May 1st and will end Friday, October 25th at noon. You can still register at the Environmental Studies Center during Packet Pick Up on Friday, October 25th from 3 – 7 PM or starting at 7 AM on October 26th. *Register by September 28th to ensure your t-shirt size. $10 for SCPS employees – Only 325 spots available so register today! Note this registration is for SCPS Employees Only! Please register using SCPS employee registration option. Want to contribute to the MudWalk Spooky 5K, but not interested in getting up early? Participate in our “Sleep-In” option. Choose the “Sleep-In” option for $20 and pick your t-shirt size. The morning of the event you can stay snuggled in bed knowing you have contributed and will have the t-shirt to prove it! Show your support for the MudWalk by becoming a sponsor for as little as $100. Learn more. For additional event questions, please email mudwalk5K@gmail.com. Please register each participant one at a time, filling out form below in its entirety. Signed Waiver - Check the ONE that applies to you to indicate consent. *	 (Adults Only) I AM OF LEGAL AGE AND HAVE READ AND UNDERSTAND THE ABOVE RELEASE AND UNDERSTAND THAT I AM ENTERING THIS EVENT AT MY OWN RISK. (Parents/Guardians of Minors Only) I AM THE PARENT/GUARDIAN OF THE MINOR PARTICIPANT AND UNDERSTAND THE ABOVE RELEASE AND I UNDERSTAND THAT I AM ENTERING MY MINOR CHILD IN THIS EVENT AT MY OWN RISK.